Conversations: Learning and Growing: Don't cry, Leah. 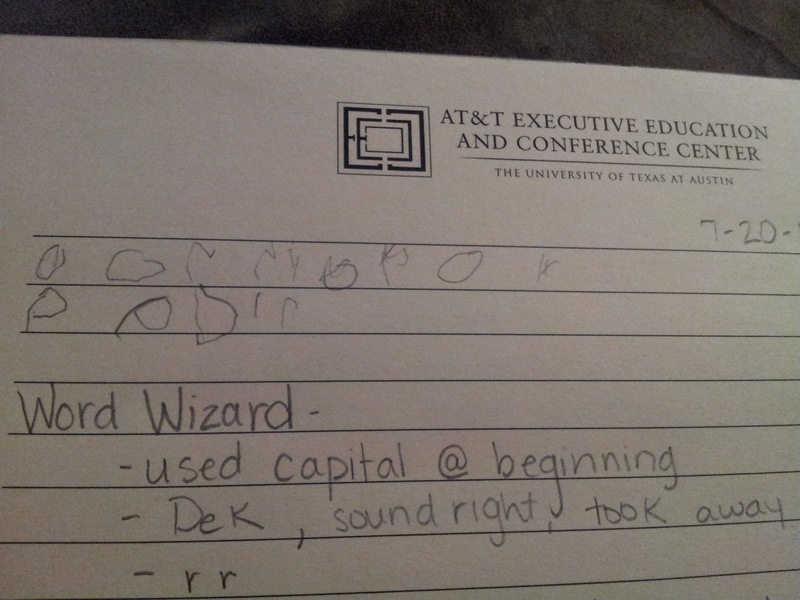 After spending the past week in Austin, I wasn't quite sure I wanted to tutor my little friend, Derrick, this morning. I was looking at the clock at 9 am, thinking I could really use the sleep. But, I went ahead and met Derrick and his dad at the library. Cuddling with his little raccoon stuffed toy, Derrick grabbed my hand, put on his walking feet, and headed into the library. We sat down to practice his name. At his age, Derrick should be able to write his name. But, he is just so far behind. It is often difficult for others to understand him when says his name with all of his communication disabilities. So, this has been a major area for me when we meet. 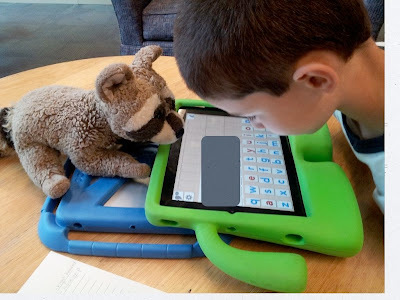 We use SO many different tools on the iPad to encourage communication, practice reading and writing skills, explore math, and develop social stories. My biggest goal is to help Derrick find ways to participate in the world around him, and the iPad has been our major tool. Today started off with hugs, smiles, and getting right down to work. Derrick began by writing his name on paper. With very loose grip on the pencil, frequent breaks, and an unrecognizable product, Derrick gave it his best shot. You can see his effort below... (along with my notes). We jumped into the Word Wizard app to continue our work. Many interesting things happened in this session. But, the first one that really caught my attention is what Derrick did with Raccoon. He used my iPad to prop up his, then he set up his stuffed toy to watch him work. He didn't have Raccoon on the table during our pencil and paper session. What a statement that made! After working for about 10 minutes with minimal prompts, Derrick started getting really excited, but not frustrated. He started tapping my hand and saying, "not word, not word". Then, he started showing me the red highlighting around the letters that he was working with and touching my ear. "Not word, not word." Word Wizard has options for hearing the letters and words read aloud as they are put together. This was what Derrick was starting to focus on. He abandoned his name and started just pulling letters together, playing with the order, and listening for results. He was getting so close to his iPad, listening so intently, and having so much fun that he forgot I was even there! Which is a very good thing because at this point I was trying to quickly wipe away the tears that were rolling down my face. 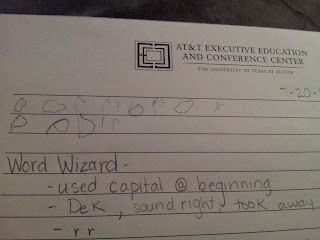 You see...this was the first time Derrick ever experimented with the letters and sounds. He has never just played with language...that is his barrier. I was witnessing a huge shift for Big D. He was doing, listening, processing, and getting excited. And, this lasted for about 30 minutes. Just Raccoon and myself, sitting with Derrick as he found language. I am not going to say that Word Wizard is the app on the iPad that everyone should roll with...I almost contemplated not listing the app. But, they did a great job with that app, and I am happy to promote their product. We finished with time in Pocket Zoo HD. I purchased this for him as a reward for his amazing work this morning, and it turned out to be another gold mine. I used the app with fifth graders because it has live cams for some of the animals, and I knew Derrick would love that! With as many items on my To-Do list, I had to write this post because I wanted to share an amazing moment. Derrick's amazing moment happened! 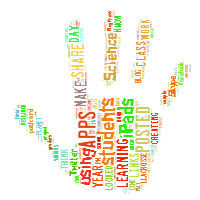 I again saw the power of transformation in learning that can occur with access to this tool, and I cannot wait to wake up next Saturday morning to work with my buddy.